“Mommy, please can I help? Please?” “Mommy, I can do it!” Young children are anxious to ‘help’ with household duties. How quickly that changes! Before too much time passes, parents have to threaten their kids with their lives before they will get their chores done. Have you noticed when you threaten to take away something your kids really want to do, they get their stuff done on time? Will they ever learn to get their responsibilities done on their own initiative? 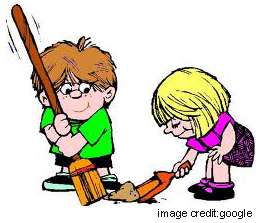 When giving your kids chores to do around the house or yard, do you find they didn’t do a good job because they didn’t really want to do it in the first place? When our son was eleven years old, he wanted to mow our lawn. He knew I had paid teens to do it previous summers, and he was ready to make money. He did a great job, doing it just the way I instructed him for the first couple weeks. He soon discovered mowing the lawn wasn’t fun, it really was a job, and he not only had to do it, he had to do it the way I wanted it done. One evening I went outside to enjoy the nice weather and I saw strips he had missed. I talked to him about it, and he told me it was getting dark when he had mowed so he would get it next time. Not pleased with this I watched the next time he mowed. He was working so fast he wasn’t doing a good job and there were once again places that were not mowed. I realized I needed to teach him to have a good work ethic, and this was a great place to start. I told him I was no longer going to pay him by the week. He would get paid monthly. If I had to remind him to do it, or if he had to do it again because he didn’t do it right the first time, he would still mow every week, he just wouldn’t get paid. I also told him he could not mow anyone else’s lawn until he could show me I could trust him to do a good job on ours without my constant supervision. On his third summer of mowing, he said his goal was to get paid every month that summer. And he did. At eleven years of age, do you think our son understood that everything he did was for the Lord? I don’t think he gave this a thought. I asked him what doing something for the Lord meant. This gave me the opportunity to teach him we can show the world God’s glory in everything we do every day. Since our office is in our home, we have a lot of people drop by the house. When they commented on how nice the yard looked and asked who mowed for us, he was giving God glory by showing others he was willing to work with his whole heart. In God’s eyes, giving Him the glory in what we do is more important than any amount of money we can make. Teaching your children to work is a key responsibility of every parent. In many ways, it will determine how successful your child’s future will be. I want to encourage you to stop reminding your kids to do what they already know they are supposed to do. Stop lecturing them when they don’t do it. They aren’t listening anyway. Give them consequences. The most effective consequence that works for all ages is to take away the freedom of what they were doing instead of completing the assigned task. If your child was watching television or playing on the computer instead of getting his homework done, he loses the freedom of the computer or television. If your child can’t get up on time in the morning, tell him (or her) if he needs more sleep he gets to go to bed earlier at night and set his bedtime one-half hour to one hour earlier, depending on the child’s age. The work ethic your children learn in your home is the work ethic they will take into their first job which will dictate the kind of employee they will turn out to be and it will dictate the way they will one day serve the Lord whether they work full-time in Christian ministry or volunteer at their church in some capacity. The importance of work ethic cannot be over-emphasized. During 33 years as a high school teacher, I met myriad students from myriad families: no matter what the students’ aptitudes, work ethic defined their success. I saw highly motivated seniors (who might have only average abilities) work their way to a 3 or 4 on an AP exam, thus earning college credit for their efforts. Conversely, I saw brilliant “budding geniuses,” refusing to do homework, not only fail AP exams but even fail in regular courses and not graduate. Just because they had been “resting on the laurels” of their gifted brains, they doomed their high school records by their refusal to follow directions and respect the guidance of their teachers. On a personal note, as parents of an adopted son diagnosed with a brain disorder, my husband and I have gone through 24 years of very difficult parenting. Because of our son’s inability to sequence, his ADD, and his scattered thinking, it has often taken him 3-5 years to learn basic life concepts that can take a “normal” young person just a year or so to learn. Nonetheless, my husband and I “fought the good fight” throughout his upbringing, and continue to do so today. Though he was unable to go to college, or even do very well in school for that matter, he has developed a pretty good work life because of what employers have said about his work ethic. Through constant discipline and excellent private school training, he learned how to interact with the public effectively, developed a huge heart for others (especially the needy), and is very good at physical/kinesthetic work that doesn’t involve a lot of paperwork. The auto dealership (where he started out washing and delivering cars) eventually made him a lot manager (training new employees, keeping the lot neat/tidy, making sure the other lot workers did a meticulous job). He was recently promoted to become a service writer; our prayer is that he will be able to manage the craziness of stressed-out customers bringing in their cars to the service dept. One thing his employers seem to agree on: he always tries hard and gets a lot done. This is so true and yet missed by many parents. Nagging becomes the norm as we run around plagued by impatience brought on by our own propensity for carrying ‘monkeys’ that belong to our children. This only produces frustrated parents and lazy children. Thankyou for the reminder to us to implement Colossians 3:23 in this aspect of our own parenting as well as encouraging it’s outworking in our children’s lives and hearts. I really appreciate the reminder to keep a strong work ethic in our home. Lately we have been struggling with our children working together well. We have 5 children (15 down to 5) and all have a wonderful, strong idea/opinion 🙂 about how a job should be completed, and they don’t always agree. I find that we just resort to just giving individual jobs bc we don’t want conflict. I feel like we give consequences and we have times of conflict resolution where we train on how to work things through, but I would love some more insight. We homeschool, so we are home during the day. Thanks Carla. Joey and Carla. . . we used your advice with our oldest who is now 19 and are we ever GRATEFUL! We have 6 other children and one on the way and we are teaching them all to be responsible, diligent workers. .. this article reminds me again to NOT lecture. . to ask questions. . .to take away what my child wants until they are willing to do their work correctly. I was just saying today how pleased I am that my children know how to take care of things and clean up. They don’t always do what they know is right and we are working with them every day toward the goal of having a heart that works as for the Lord. We know it will make a HUGE difference for them when they reach adulthood.